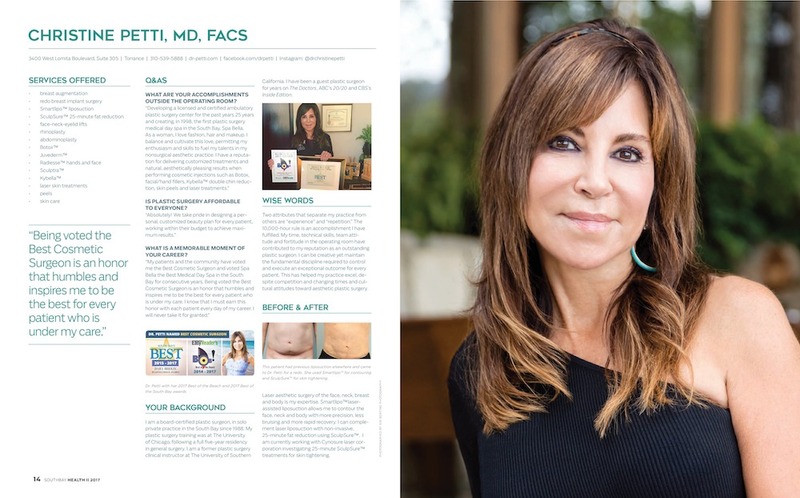 Southbay magazine, a lifestyle publication that highlights the best of California’s southern beach cities, has published an in-depth profile and interview featuring Torrance plastic surgeon Christine Petti, MD, FACS. Over the last 25 years, Dr. Petti’s practice and medical day spa, Spa Bella, have gained a prominence among residents of the South Bay area and nationwide. Known for her personal, customized approach, state-of-the-art techniques, and natural-looking results, Dr. Petti expertly performs a broad range of aesthetic treatments and plastic surgery procedures that help her patients look their very best. Her immense success is reflected not only in the consecutive awards she has won locally (Best Cosmetic Surgeon and Best Medical Day Spa), but also in the glowing online reviews and five-star ratings her patients continually provide. In her Q&A with Southbay Dr. Petti goes into detail about the highlights of her career, areas of expertise, background, and what sets her apart as an outstanding plastic surgeon. If you are interested in learning more about Dr. Petti and her reputation as one of the South Bay’s finest plastic surgeons, we encourage you to read her full feature profile. You can also get more information about Dr. Petti and all of the services she provides by exploring our comprehensive website, which includes educational resources about procedures, a before-and-after photo gallery, Dr. Petti’s appearances on The Doctors, and much more! To schedule a one-on-one consultation with Dr. Petti, please contact our office.